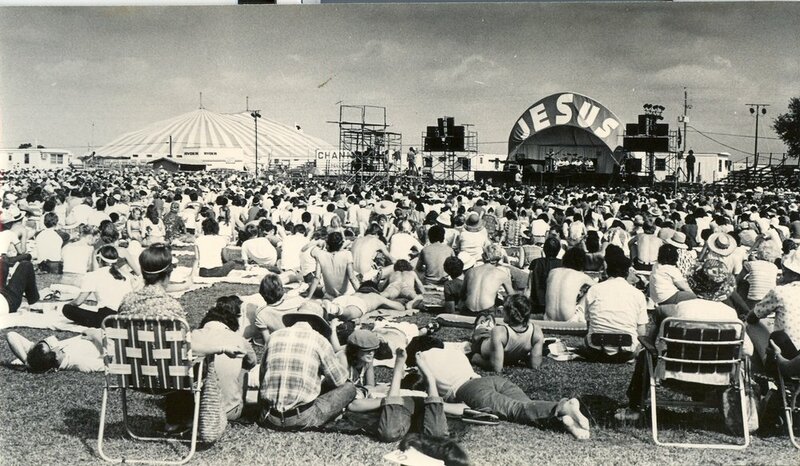 In our last blog we took a journey back in time to the 1960’s and 70’s as we reflected on what was known as the Jesus Movement. In the last blog we gave a snapshot of the background to the movement and concluded with three reminders for us here in 2018, lessons learned from the Jesus Movement that are still applicable today. The first thing to note was that as then, and today, no one is outside the salvation touch of God. We noted Acts 9 where Paul, who had been the main persecutor of the early church, came to faith in Christ as Lord and Savior. God can save anyone who comes to him in repentance and faith. A second point we made was that walls were broken down during the Jesus Movement. Yes, some churches struggled with what was happening, but God was working in dealing with the judgmental hearts of Christians as people who did not act and dress like them were coming to know Jesus. And third, discernment was important then, as it is today. There were many good things happening during the Jesus Movement, but some cults also arose at the time. The enemy was at work too, trying to counter what God was doing in the lives of people. As we continue in this blog I would like to share a few more things we can learn from the Jesus Movement that are just as important for us today as for those involved back then. One thing worth noting is that there was a genuine hunger to know the Bible. It seemed that theology mattered. Though there were some doctrinal aberrations that arose, most of those involved in the Jesus Movement believed man was a sinner (Romans 3:10-23; Romans 5), that Jesus died on the cross as a substitute for our sins (Mt. 20:28), that salvation was through faith in Christ alone (Romans 10:9-13; Eph. 2:8-10). They were also Trinitarian in their beliefs (Jn. 1:1, 15; Acts 5), though some “Jesus only” groups sprouted up, they were in the minority. They also held, for the most part, the view that the Bible was inerrant (2 Tim. 3:16). They had a high regard for the Scriptures. This, of course, was tied to the churches and teachers who were reaching out to these individuals and helping them discover God in a personal way. But it is worth noting that when it came to the historical tenets of the Christian faith, many of these new believers were grounded in the truths of Scripture. Theology does matter. What we believe often dictates how we live. It must also be noted that there were those within the movement whose theology was in a state of change. Often the influence of teachers, writers, and individuals would cause people within the movement to reconsider what they believed. It is good to be continually learning but there is also the danger of dependency upon a person to determine our beliefs. No doubt, some within the movement, being young Christians, were easily swayed. It is important as we teach others what the Bible says that we focus on the Scriptures, not on personalities. A second thing we can learn is that being a part of the church as a Christian is important. Though there were some within the Jesus Movement who seemed to have a disdain for the church as an institution, many were involved in local churches. In fact, some in the movement looked upon the church as apostate. Communal living became very popular as an outgrowth of the Jesus Movement. This was, for some, a way to live without being necessarily connected to the local church. But the whole of the New Testament points to the need to be connected to a local church. Jesus believed in it (Matt. 16:18), and many of the books are addressed to churches in cities such as Ephesus, Philippi, Thessalonica, etc. The church is important. We need other Christians in our lives for encouragement, correction, laughter, learning, praying, and spiritual growth. A third and final thing we can see is we need to never box God in. As we mentioned in the last blog, there were people coming to Christ that probably shocked some people. Many in the drug culture found that Christ was the answer to their deepest needs. Sometimes we have a tendency to try to keep God in our own little box of what we think He can and cannot do. As theologian Gordon Fee has written, “God has the right to be God.” God is not held in sway or under control by us. He is God and He is free to be God. He is at work in the world and we must never forget that. These are just a few more reflections from the Jesus Movement that are just as applicable for us today. Have a great day.